Xiaomi isn't keen on packing more than the very basics. Just like in the previous generation, the Xiaomi Mi 4's packaging is made of recycled paper and contains only an A/C adapter and a microUSB cable. XiaomiShop.com, the provider of our review unit, throws in a bunch of freebies in every box and ours came with a screen protector, a fancy flip case, an EU adapter, a USB car charger plug, and a small capacitive stylus that conveniently plugs into the 3.5mm audio jack. 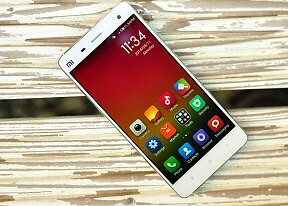 Even though the Xiaomi Mi 4 has the same 5" display as the Mi 3, its footprint is smaller. This is possible thanks to the much slimmer screen bezels. The Xiaomi Mi 4 measures 139.2 x 68.5 x 8.9mm - half a centimeter shorter and narrower than the Mi 3. The Xiaomi Mi 4 has gained some weight compared to the Mi 3 (to a total of 149 grams). It's only 4 grams worth of a difference, hardly anything you'd notice, but the solid feel is there. Xiaomi took a U-turn with the Mi 4 design, dropping the polycarbonate unibody, which we praised, in favor of a metal frame with flat sides a la iPhone 5s, complete with a hard-to-remove rear cover. The visual change is controversial. We really liked the Lumia-like design of the Xiaomi Mi 3, subtly and effortlessly elegant. The Mi 4 is by far more sophisticated but not as convincing. Maybe it'll have its fair share of fans too. The back cover on the Mi 4 is certainly removable, proven by the assortment of swappable back covers to choose from, however it's certainly not readily removable. There are as many as 17 clips holding it tight and you would really need a small suction cup to undo them with pulling. The stainless steel frame is definitely the highlight of the Mi 4's exterior. It adds to the phone's style and gives it the premium feel it deserves. The rear cover is made of glossy plastic, which is prone to fingerprints and smudges. If kept clean though, the Mi 4's back is nice, reminiscent of a glass shell. 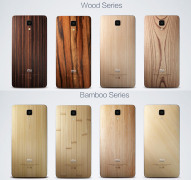 Depending on where you reside, you might have an option to purchase some optional rear covers, which have the texture of wood, marble, bamboo, textile or leather. Those will definitely made your Mi 4 look unique compared to whatever smartphone you place it next to. Unfortunately, details are sketchy on the markets where those will be available. The front of the Xiaomi Mi 4 is occupied almost entirely by the 5" IPS display. There is nothing official on the kind of screen protection used, if any, and since it isn't mentioned anywhere we can safely rule out Gorilla Glass. This probably explains the supplied screen protector. Here is a set of shots that shows just how different the Xiaomi Mi 4 is to the Mi 3. Instead of a polycarbonate unibody, the Mi 4 is built around a machined metal frame that houses all the components. 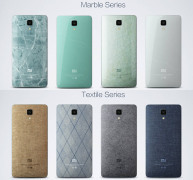 We appreciate the effort but we find the understated look of the Mi 3 more appealing. One thing's for sure, as soon as those optional Mi 4 cases are available for sale, we might reconsider as it's mainly the slippery plastic back cover that ruins the high end feel and build quality. The Xiaomi Mi 4 is as solid as it gets and even though its back might get slippery, the Mi 4 makes up for this with the grippy metal frame. There are no wobbles or squeaks, it feels great in hand and does slip easily in a pocket. It isn't the most compact handset around, but it's more compact than the Mi 3, we'll give it that.